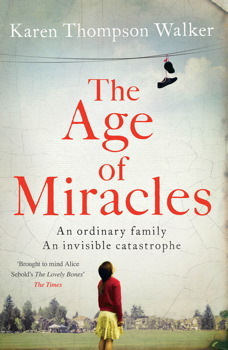 The Age of Miracles is a fabulous read that explores people’s behaviour in impending doom. The novel is set in California and is narrated by 11-year-old Julia. Just weeks before Julia’s birthday it is discovered that the world is undergoing an unexplained phenomenon which the scientists call ‘slowing’. The hours of a day begin to increase steadily and life on Earth begins to alter. Some people try to adapt, some believe that it is just a government hoax, others that it is the wrath of God. However, most chose to follow ‘clock time’, where the world functions normally, according to the normal 24 hour clock, whether or not it is light or dark outside. As relationships begin to form and people act differently, Julia finds herself getting closer and closer to her long time crush Seth Moreno. But the slowing not only has an effect on relationships, but also on the psychological ways in which people act. A new form of illness is spreading and people are calling it ‘the syndrome’ and when Julia finds out that Seth has a particularly aggressive form, her world is turned upside down again. The Age of Miracles is an outstanding novel which allows readers to explore the notion of what it would be like to live in a world where the Earth is slowing and the extinction of the human race is almost inevitable. It shows how in the face of such a horrible situation, two people can find comfort in each other’s company. Not only this it shows how much people can change and how their true colours can shine through when there’s danger.